AE Smith is being appointed to lead the coordination of Building Information Modelling (BIM) integration across all trades that cross paths on a single project. As a result, we have many real examples of where insight about information has helped our clients increase profitability through improved productivity, clash detection and a reduction in rework and variations. AE Smith has moved down the line of paperless sites with our construction team now fully digitised. Everything is on tablets, including the commissioning team. With information always available and current, communication is sped up and works are accurately informed. The error rate associated with different trades working off incompatible or even out of date plans has been dramatically reduced. Because our team is online, they can submit any onsite impacts and progress directly back into the BIM model at the end of the day. This evolving extraction and submission of information ensures everyone knows what’s next. We can schedule works and resource more precisely, so there’s far less chance of someone standing idle with a shovel while an issue is resolved. One of the greatest productivity gains is through utilising parallel manufacturing technologies. 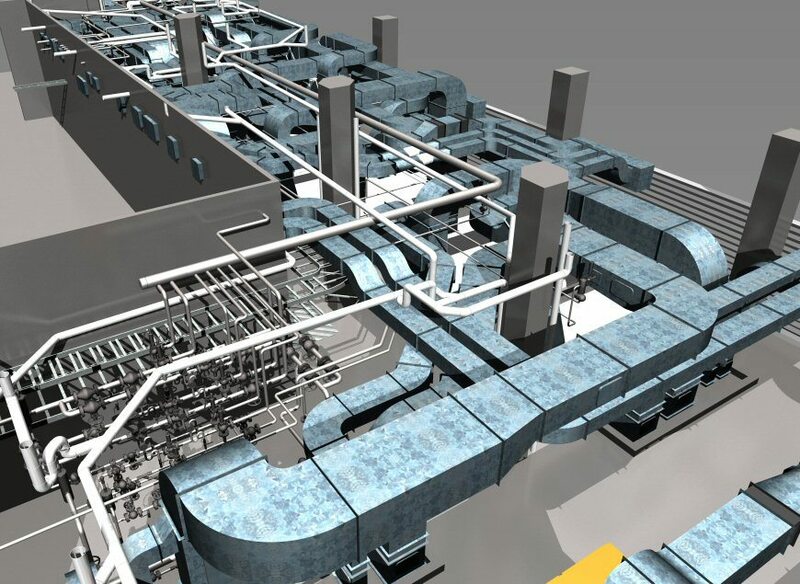 BIM allows us to pull the design apart and make modules, which can then be prefabricated and delivered to site in cages, ready to be connected. This approach dramatically improves site productivity. Whilst we manufacture offsite, the builder can move forward onsite leading to time savings along the critical path and significant workplace safety enhancements. Revit® by Autodesk® is a CAD package that virtually builds in 3D and in the digital space. It gives a feeling of depth, so services including electrical, medical gases, HVAC and plumbing can all be looked at in conjunction. Because all trades utilise the same model it radically reduces clashes. For example, if ducting is removed, or pipes are introduced, other trades such as the ceiling or wall installers need to adjust heights and depths accordingly. In a traditional build this type of scenario often results in rework, because trades aren’t aware of changes taking place dynamically. This can be costly both in time and materials. Whereas when all trades are working from the same model, specification information immediately informs design and adjustments can be made accordingly before work begins. Essentially, it’s much cheaper to make changes on-screen than onsite. Often in a Design and Construct (D&C) project there is a requirement for dynamic type designs, with clients requesting variations. When you have a conceptual 3D model, this helps the client to visualise the project and can immediately show the implications of a change both on design and cost. Data from overseas shows BIM can significantly reduce change orders and variations from 20% to 25%. At AE Smith, we’re experiencing similar levels of reduction in variation with our clients. As an industry we are working together to develop the core approaches of BIM and the standards for how all projects are carried out. AE Smith are also involved in developing a BIM enablement course for trades, to ensure basic skills are learned to use technologies effectively. For example being invited by AIRAH to host their “BIM: The Basics” national seminars series around Australia in 2014 (see right). In the case of BIM, there is no doubt that knowledge about information equals improved profit margin. The entire value of BIM will only be truly realised when there is collaboration between all practitioners and trades, throughout all stages of design and construction right through to ongoing facility management. “BIM: The Basics” Is AIRAH’s 2014 national seminar series at which Mark Jacobson, M.AIRAH & AE Smith National BIM Operations Manager, will illustrate how a well-executed BIM project can substantially improve a building’s operation and maintenance. AIRAH (Australian Institute of Refrigeration, Air conditioning & Heating) is recognised by government and industry bodies for its expertise across a wide range of issues in the area of engineering services for the built environment.